The GCA50 or CAN-GC2 are only able to switch 25mA by 5 Volt on each output. This is fine to switch a relay like Omron GV5-1 but then there is only 1 Amp maximum allowance. Even that 1 Amp is too much, if the relay has to switch the full load many times. To make it possible to switch up to 10 Amp, a bigger relay is needed, and also some way of controlling that relay from LocoNet. One option is to switch a relay like Omron G2R by use of GCA77. But if you need to setup a GCA77, just for the relay only, then this unit provides all in one. One side is connected to an output of GCA50, and to a power adapter 12-16V dc or transformer with max 18V ac. The other side has a connector which provides a Normal open and normal close contact. One or both can be used. I constructed this because most railroad will have (at least I have) a transformer for feeding illumination and also for the power to GCA76, GCA77 or GCA136. In order to be able to use that transformer for powering this relay, an on-board opto-coupler separates the supply from LocoNet GCA50. Anything up to 10Amp can be switched now. The MGV120 is developed to switch a max of 42 Volt. 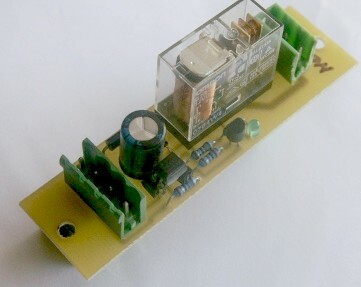 The relay will be able to handle 230V, but CE regulations demand an open space of 5mm between tracks on the pc-board and connections. Both connector J2 and the tracks to the relay do not comply with that. Also, an correct isolation is not taken care for. So 42 V is the maximum allowance. Depending of the used supply, please consider that the relay must be adapted to that. See bill of materials. - Opto isolated input for 5-12Vdc (like from GCA50 or CAN-GC2). - 42V - 10Amp power switching. - supply 12 Vdc or 16 Vac (look in bill of materials for differences). All connections are signed at pcb drawing.